As the Cassini spacecraft executes its final daredevil maneuvers, scientists on both sides of the Atlantic are already thinking about the next mission to Saturn. But this time around, nobody’s talking about studying the gas giant itself. They’re talking about hunting for life in Saturn’s rings. Two Saturnian moons—Titan, a world of frigid methane seas, and Enceladus, a cratered ball of ice wrapped around a liquid water ocean—are on the shortlist of places in our solar system where alien life might exist. And scientists are determined to find out if it does. 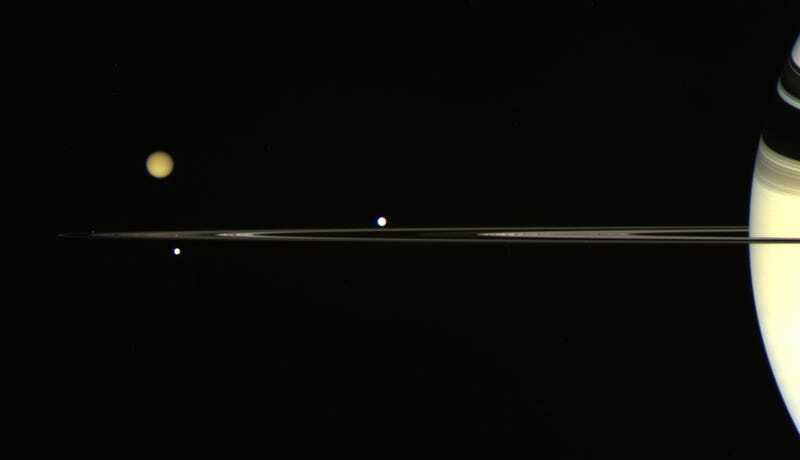 That much was clear at last week’s American Geophysical Union conference, where American and European researchers presented proposals for two future spacecraft that would determine if Saturn’s strangest moons are habitable. On the American side, there’s the Enceladus Life Finder (ELF), a proposed NASA New Frontiers-class spacecraft whose mission is in its name. ELF’s flight plan is simple: ten low-altitude (30 mile/50 km) passes over Enceladus’ south pole, where cracks in the moon’s icy crust spew frozen ocean water into space. Diving through Enceladus’ south polar geysers, ELF would sample the moon’s ocean water like Cassini has already done, but with fancier instruments. Two state-of-the-art mass spectrometers would search for key indicators of habitability, including hydrogen gas (an energy source). The spacecraft would also hunt for life directly by profiling amino acids and carbon isotopes, which occur in specific patterns when microorganisms are present. Enceladus’ subsurface ocean is one of the most Earth-like environments we know of out there. But it’s also possible that a different form of biology—a far stranger one—could have sprung up in Titan’s methane seas. So, why only search for life-as-we-know-it when we can visit both moons on the same trip? The Explorer of Enceladus and Titan (E2T), a proposed medium-class European Space Agency (ESA) mission, seeks to do exactly that. Similarly to ELF, E2T would fly across of Enceladus’ south polar plume (although only six times), at altitudes of 30 to 90 miles (50 to 150 km), and use two mass spectrometers to profile the seawater for signs of life. E2T would also be equipped with a fancy space camera that could snap gloriously high-res images of Enceladus’ surface, down to resolutions of three feet (one meter) per pixel. E2T would also visit cloudy Titan, collecting and analyzing air samples samples during 17 passes through the moon’s atmosphere at altitudes ranging from 930 to 560 miles (1500 to 900 km). We already know there’s some “pre-biotic chemistry”—organic reactions that can lead to the formation of RNA and proteins—taking place in Titan’s skies. With E2T, we’d be able see just how close that chemistry has gotten to creating the building blocks of life. E2T will also take detailed images of Titan’s surface, which features Earth-like rivers and canyons carved by liquid hydrocarbons instead of water. Giuseppe Mitri, the lead proposer of E2T, believes the time is ripe for a dedicated astrobiology mission to the outer solar system. “There is a great deal of interest in the community right now,” he said, noting that ESA’s new mission to Mars, ExoMars, is also searching for hints of alien life. Of course, there’s no guarantee that either of these missions will be green-lit, and even they are, we’re still years off from finding our cosmic neighbors. (ELF is seeking funds for a 2025 launch, with an expected arrival at Saturn by 2030, while E2T wouldn’t get off the home rock until 2030 at the earliest.) Both proposals need hundreds of millions of dollars to be realized, and both are competing for funds with a lot of other good ideas, including, potentially, missions to survey Venus, to rendezvous with a Trojan asteroid, and to collect a rock sample from the Moon’s south pole. Still, if the astrobiology community’s recent thinking is any indicator, at some point in the next decade or two, we’re going to head back to Saturn. And when we do, it’ll be to find aliens. Remember that next time you’re feeling down about the human race.